Did you know there are over 58 cities or conglomerates with 1 million or more people in the North American Division territory? Perhaps, if I called some of these out, you would recognize them: New York, Los Angeles, Chicago, Washington D.C, Philadelphia, Boston, Toronto, Montreal, Vancouver, Las Vegas, Virginia Beach, Calgary, and Louisville among others, many others, there are 58 of them, with over 1 million people. 1. Cities are filled with people whom Jesus loves, and who need Jesus. He came to seek and to save the lost, and by this he meant people, and there are many people in these 58 urban areas. With the exceptions of the times when Jesus needed a break to recharge, he was often found with the people. Wherever people were, so was Jesus. It would be out of character for the church that shares the love of God, the Compassion of Jesus, and proclaims the everlasting Gospel to shy away from the very people whom we have been commissioned to reach and disciple. 3. There are great needs in the city. As I travel across North America I see the contrast between the city skyline and downtown high-rises and the nearby neighborhoods filled with people in need. Unless our church is in the city, we will never know, understand, or be able to show the love of God and the compassion of Jesus to the families and people who need it so much. Blessing people with no strings attached in the time of their greatest need can create an affinity, which perhaps will lead them to follow Jesus, when they see His love reflected through our actions and our words. 4. There is wealth, power, and influence in the city. A church that is invisible will have a very hard time blessing and ministering the influential and wealthy, many of whom work and reside in cities across our Division. Students, professors, business people, political leaders, media personalities, and many others dwell and carry out the majority of their activities in the city. Who will bless them and minister to them if we have no presence in their midst? 5. Multi-cultural population in the cities. The mandate to reach the world, becomes a bit more accessible in cities, where you may find people of just about any race, tribe, nation, and tongue. There are ministries which spend millions of dollars ministering to unreached groups across the world while those very groups reside, right here in North America, in their backyard, in a near by city. Missions abroad are vital and as a North American Church we have pioneered a missionary movement which has seen great growth across the world. Still to this day, we lead the way in mission support, not only financially but with the sending out of missionaries. Yet we have been blessed with waves of immigration which God has brought to our cities, thus making it possible to reach people from every corner of he world right in our cities. Yet, we will never know or be able to do anything for those whom God has brought to us, unless we intentionally venture into the city. 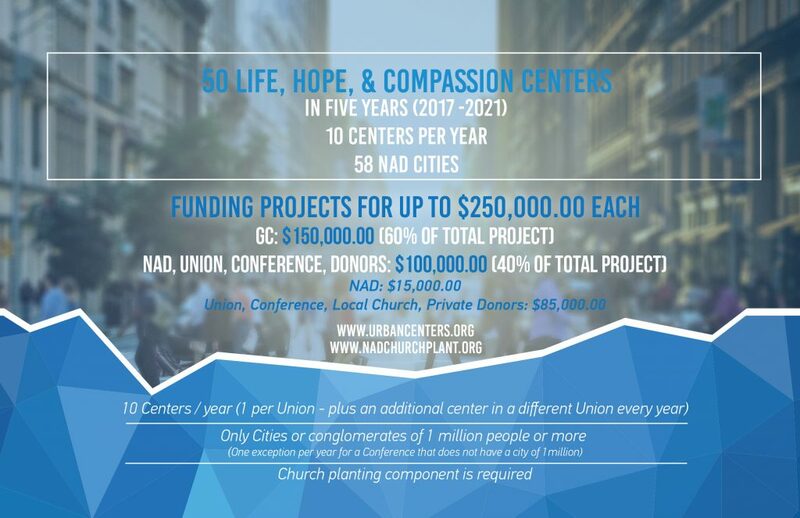 The North American Division of Seventh-day Adventists, our Unions, and Conferences are partnering with the Office of Adventist Mission of the General Conference in an initiative to launch Urban Centers of Influence, also known as Life Hope Centers, or Compassion Centers in our Division. The purpose of this initiative is to bless the people of our cities, as Jesus did, by loving them, meeting their needs, gaining their confidence, and sharing our hope with them. Funding has been set aside by the General Conference and the North American Division to collaborate with Unions, Conferences, Churches, and private donors who may wish to contribute in the creation of Urban Centers of Influence in the 58 cities and conglomerates of a million people or more of our Division. Of course, we have not forgotten about our smaller cities, there is one exception per year for Conferences which do not have a city with a million inhabitants or more. Our smaller cities are very important too. If your church is interested in establishing a Center of Influence using the method of Christ in your city, please contact your Conference Evangelism Director and Administration and let’s dialogue. Because it is time! It is time to reach the people of our North American cities with Christ’s ministry and message of compassion, hope, and wholeness.